Alexander Rodchenko (1891-1956), formally a painter, retired from painting in 1921 and became a designer of posters that became iconic of the brief period of favoritism and freedom. A patriot, loyal to this new Russia he stated, “We had visions of a new world, industry, technology, and science. We simultaneously invented and changed the world around us. We authored new notions of beauty and redefined art itself.” In 1923, he supported, in a series of posters for Lenin’s New Economic Policy. The NEP was a temporary solution to post-war recovery of production, which allowed private enterprise to exist alongside state-owned enterprises. 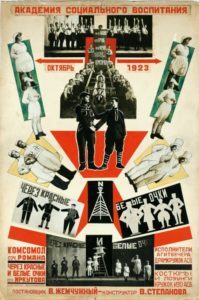 Rodchenko, now one of the Constructivist artists, working for the good of the state, created a series of posters extolling the virtues of government production. 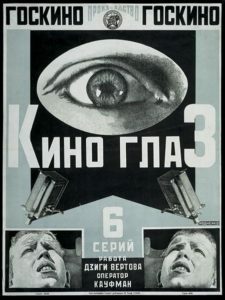 These productions, like his film posters, were complex, reflecting the principles of an organization of artists who identified themselves as the Left Front of the Arts, of which Rodchenko was a member, along with Sergei Eisenstein and the group’s leader, poet Vladimir Mayakovsky. The artists, including a stage director and a literary theorist, published a journal LEF from 1923, which became Novyi Lef (New Left) between 1927-28, with all covers designed my Rodchenko. LEF was a response to the government requesting that artists join in with the NEP in which the contributing artists wrote of the links between progressive art and leftist politics. The roster was an impressive list of prominent Russian intellectuals and artists, from the leader, the poet Vladimir Mayakovsky, filmmaker Sergei Eisenstein, stage director Vsevolod Meyerhold, and the writer Sergei Tret’iakov, who said that the artists wanted “the production of a new human being through art.” All of the artists of the Russian Revolution and its aftermath were convinced that a new way of life required new forms that expressed the sea change. By using new forms, signifiers of new ideologies which had replaced the old ways of thinking, art could send transformative messages which operated through viewer participation. 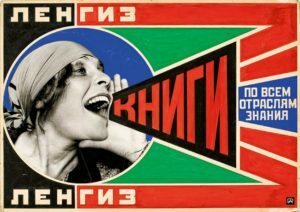 Rodchenko’s posters and mass media designs were laid out with the intention of drawing the reader in and inviting him or her on a visual and ideological if not didactic message. One of the most important theories for that group was that revolutionary art necessitated the participation of the spectator, meaning that the audience learned and was educated in the process of looking at visual images. Eisenstein, for example, used montage, editing, in his film, Battleship Potemkin, as effectively as Rodchenko in his posters. The breaking of the cinematic practice of sustained looking at a series of moving pictures, Eisenstein cut a scene with interacting images, speeded up into intense activity, meant to involve the viewer in his story of a Cossack massacre of innocent civilians in the 1905 uprising. The Odessa Steps sequence is still today one of the longest sustained sequences of edits, bringing a new visual vocabulary of dynamism and frenetic rhythm to a once staid medium. Although the LEF group asserted its politics as leftist avant-garde artists against the more conventional artists working for the Revolution, the work done by Rodchenko was, in its own way, humble. 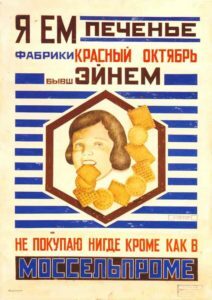 His designs, like the work of Eisenstein, were montages of works and images, arranged in a manner reminiscent of Futurist and Dada compositions, to extol the virtues of Soviet airplanes and Soviet cookies, charmingly named “Red October,” and Soviet caramels, amusingly named “Our Industry,” and beer. These otherwise mundane enterprises were government run and therefore, were worthy of Rodchenko’s attention. Aside from the stunning packaging for caramels and the famous poster for the revolutionary cookies, his best-known poster is probably the advertisement for Lengiz state publishing house with the promise that the firm sells “books on all the branches of knowledge.” This 1925 poster for the Leningrad department of state publishing house “Gosizdat” shows a lovely fresh faced Russian worker, a young woman with a headscarf capping her short curly hair. Her hand is up to her open mouth and she is calling out, joyously. Indicating that her hand is a megaphone, a triangle of expanding letters shoots out to the right. In contrast to the usually subdued dull oranges and blacks of most his posters, Rodchenko used strong reds and greens, complementary colors that activated the eye. Toned down with a bit of blue around the front of the face, the black and white photograph of the woman nails the poster to the news of the day, to the revolutionary present. She is calling to her comrades to come and read, and, in the process, become educated by this state media agency. Education was deemed essential to the political conversion of a backward peasantry and illiterate proletariat to the new communist philosophy, meaning that literacy, teaching the population to read, was a primary goal of the Communist government. Posters, part of the broader agitprop campaigns were considered critical to the transformation of the unlettered masses to workers who felt empowered. From the very early years of the new Soviet government, art was an important weapon to be wielded in the service of the perpetual revolution. The presses that had once produced books or magazines were temporarily idle while the Reds battled the Whites, meaning that mass produced posters had to speak for the Bolsheviks or the Reds. Perhaps because they were supported by the Allied forces, America, Great Britain and Canada, Whites had no comparable agitprop machinery to call upon. The Bolsheviks marshaled public support until, finally in 1921, the civil war ended, with the Red, the color of revolutions everywhere since the French Revolution, being victorious. Unlike the Whites who were fighting for a more familiar status quo, the Reds promised a new world and a new future and they had a strong message to convey. Well into the 1930s, a continuous deluge of posters, which were plastered everywhere, sent the same few messages, repeating the story of revolution and the liberation and rise of the heroic workers. Just like the basic message of the promises of Communism, the posters themselves had to share similar visual themes, all based upon the unifying color and a common art language. During the early years, before doctrinaire formula were established, the former avant-garde artists were allowed by the government authorities to experiment with the new visual vocabulary circulating in Europe—ideas from Germany and Switzerland mingling with Constructivism in Russia—recycled back to and from the Bauhaus and De Stijl. Given the destruction of the Great War, this creative flourishing was an astonishing contrast to the very real economic difficulties and the political struggles in Germany and Russia, but during the 1920s, art and ideas traveled freely across borders. Pre-war Suprematism, with Futurist-inspired floating geometric shapes darting across the canvas, developed by Kazimir Malevich, was translated into a graphic language. The abstract forms became vehicles for images and words. The population–the masses, who were the target audience for the agitprop posters needed simple words or phrases and easily recognizable images. 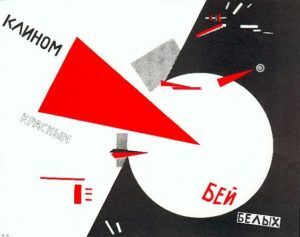 For example, one of the most powerful and impactful designs of the Civil War period, Beat the Whites with the Red Wedge of 1919, was exactly what it said: a red triangle, long and sharp shoots in from the left and, in a thrusting phallic manner, penetrates a passive white circle, carved out of the black field on the right. The artist, El Lissitzky (1890-1941), scattered words completing the design, allowing the contending shapes to imply war with shrapnel shards of red splintered across the fields of white in a barrage of color. However, easy it was for viewer familiar with avant-garde styles to translate this abstract image, an uneducated person would have been puzzled. The solution to the problem of visual translation devised by Rodchenko was to insert photographic images into what were Suprematist shapes transformed into a constructivist ideology. The photomontage traveled from Germany to Russia where it was repurposed and reused in a less radical and more direct fashion. Working as an engineer with impersonal precision at the behest of the client, the revolution, the former artist backgrounded—as it were—avant-garde styles and foregrounded familiar photographs that had the advantage of being documents and carriers of truth. Therefore, in contrast to his own New Vision photography, the images Rodchenko used for his posters and journal covers were conventional and easily understood, directed at a mass audience who needed direct communication. Where his posters differed from the precursors, the ROSTA wood block prints, was the rejection of Russian tradition in favor of using the German practice of political critique—the photomontage—and transforming it into a signifier of modern art being mobilized in a modern fashion for a new form of mass media. These carefully designed photomontaged posters, created to catch the eye and to be legible, used powerful combination of words, lettering and colored segments and patterns. 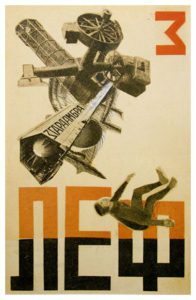 Some of these classic propaganda posters, designed by Rodchenko’s wife Varvara Stepanova (1894-1958), were unique contributions to avant-garde poster design. Bauhaus posters tended to not include photography and the Germans used photomontage as a political weapon against the government. Rodchenko’s faithful service to the Soviet Union did not help him, although he also gave his time and talents of Stalin in the 1930s. However, as the Soviet Union became more normalized, losing its revolutionary edge, the focus of the government became consolidating power under one man, while siphoning power from the “soviets” or the local councils. After the death of Lenin and the demise of the original revolutionaries, Stalin and those around him were unsympathetic to a sophisticated art that could not be easily read by the masses. Despite their contributions to Soviet art in the formative hours of the Republic, Rodchenko and Stepanova lived out the last decades of their lives, during and after the Second World War in relative obscurity. Compared to their colleagues, they were lucky.